considering the government has a history of interpreting things differently from everybody else, maybe we should use a word that is less ambiguous. 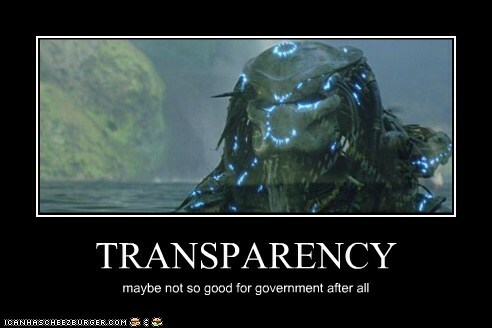 transparency can refer to being both more visible and invisible. the former is what we want from our authorities - we want to be able to see what their doing to make sure they're really protecting our interests. when what they're doing is invisible our authorities can become our adversaries without us even noticing.